Geneva, Switzerland (April 10, 2019) – Cirque du Soleil at Sea is a unique entertainment concept created by MSC Cruises the, world’s largest privately owned cruise line, and Cirque du Soleil, the world-leader in live entertainment. In March 2019, two brand new Cirque du Soleil at Sea shows launched on board MSC Cruises’ new flagship, MSC Bellissima. The leading cruise line has revealed today details of the inspiration and creative process behind these two original new shows along with the first images of the spectacular performances. Every element of each new Cirque du Soleil at Sea show is unique from the concept, storyline, the characters, the costumes and make-up through to the music, staging and sound effects. The concepts are first developed by the experienced and talented creative team based at Cirque du Soleil’s international headquarters in Montreal, Canada. Following a rigorous casting process and intensive ideation workshops, the shows are then refined and brought to life on board the ship in the custom-built entertainment venue, the Carousel Lounge, designed to meet the specific needs of Cirque du Soleil. SYMA is a fantastical odyssey into the heart of an imaginary world, and the search for a mysterious island inhabited by phantasmagorical creatures. The original idea was that an MSC Cruises’ ship is like an island in the middle of the ocean. The guests on board MSC Bellissima are embarking on a journey of discovery, just like the main character of the show. Immersive video images, an original set design, bioluminescent lighting and acrobatic feats make SYMA an unforgettable show. Discover VARÉLIA, a tale of modern chivalry where love and courage triumph over the greatest divides. The show title could have been ‘some time’ as it mixes eras using chivalry novel codes with modern and contemporary elements. A medieval tale with a futuristic twist. The inspirations lie in the cartoon world using a simple story arc but offering a multi-layered interpretation with a humoristic touch. Delight in the acrobatic feats, the laser show and the unique set design of this futuristic medieval tale. Cirque du Soleil at Sea is a pre-booked experience for guests with competitive rates and can be booked in advance, or while on board during the cruise, if availability allows. Guests can either book to enjoy a three-course menu of palate-pleasing dishes served before the show ($39), or sip on a specialty cocktail ($17) and enjoy the pre-show that begins 30 minutes before the start of the Cirque du Soleil at Sea performance. MSC Meraviglia was the first ship to debut the new Cirque du Soleil at Sea concept with the launch of the two shows VIAGGIO and SONOR in June 2017 and the ship recently celebrated the 1,000th performance. 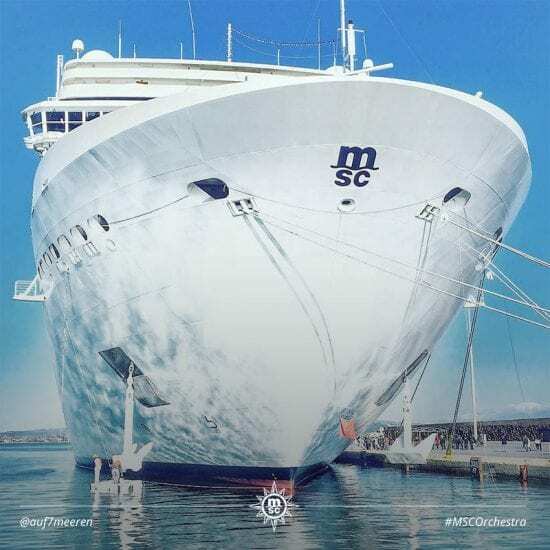 Work is already underway for the next shows for MSC Grandiosa, launching in November 2019.